Sean Scully was born in Dublin in 1945 and raised in South London. Wanting to be an artist from an early age, Scully attended evening classes at the Central School of Art in London from 1962 to 1965, and enrolled full time at Croydon College of Art, London from 1965 until 1968. He received his Bachelor of Arts from Newcastle University in 1972. He was awarded the Frank Knox Fellowship to Harvard University in 1972, where he visited the United States for the first time. In 1975, he moved to New York full-time. Today, he lives and works between New York and Bavaria. With a career that spans more than five decades, he has received numerous accolades and has been the subject of multiple touring exhibitions. In 2014, he became the first Western artist to have a career-length retrospective in China. Follow the Heart: The Art of Sean Scully 1964 – 2014 included over 100 paintings and travelled from Shanghai to Beijing. Scully was named a member of the Royal Academy of Arts in London in 2013, and has twice been shortlisted for the Turner Prize. He has received honorary degrees from institutions such as the Massachusetts College of Art, Boston; the National University of Ireland, Dublin; Universitas Miguel Hernandez, Valencia; Burren College of Art, National University of Ireland; Newcastle University, UK, among others. A series of essays and conversations between Scully and the esteemed art critic Arthur Danto was published by Hatje Cantz in 2014, and a collection of Scully’s own writing, selected speeches and interviews, Inner, was released in 2016. Current and forthcoming solo presentations of Scully’s work include The Wadsworth Atheneum, Hartford (Sean Scully: Landline, 23 February – 19 May 2019); National Gallery of Art, London (Sea Star: Sean Scully at the National Gallery, 13 April – 11 August 2019); Villa Panza, Fondo Ambiente Italiano, Varese (Sean Scully: Long Light, 18 April 2019 – 6 January 2020); LWL-Museum for Art and Culture, Münster (Vita Duplex, 5 May – 8 September 2019); San Giorgio Maggiore, Venice (Sean Scully: Human, 11 May – 24 November 2019); Instituto Cultural Cabañas, Guadalajara, Mexico (Sean Scully: The Mexico Years, 23 May – 29 September 2019) and the Albertina, Vienna (Sean Scully: Eleuthera, 7 June – 8 September 2019). 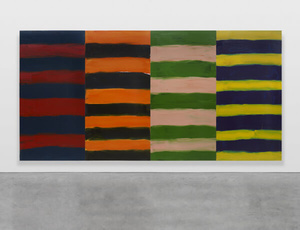 Significant recent solo exhibitions of his work include Sean Scully: Landline at the Hirshhorn Museum and Sculpture Garden in Washington, D.C. (13 September 2018 – 3 February 2019); Sean Scully: Inside Outside at Yorkshire Sculpture Park, Wakefield (29 September 2018 – 6 January 2019); Landlines and other recent works at De Pont Museum of Contemporary Art, Tilburg (21 April – 26 August 2018); Vita Duplex at Staatliche Kunsthalle Karlsruhe (24 March – 5 August 2018); Sean Scully at Cuadra San Cristóal, Mexico City (7 February – 24 March 2018); Facing East at State Russian Museum – Marble Palace, St. Petersburg (3 March – 9 May 2018) and Multimedia Art Museum, Moscow (3 November – 10 December 2017); Resistance and Persistence, Museum of the Nanjing University of the Arts (8 April – 8 May 2016), which travelled to the Museum of Art, Guangzhou, China (6 September – 9 October 2016) and Hubei Art Museum, Wuhan (10 January – 12 March 2017); and Follow the Heart: The Art of Sean Scully 1964–2014 at Shanghai Himalayas Art Museum (23 November 2014 – 25 January 2015), which travelled to Central Academy of Fine Art (CAFA), Beijing (12 March – 23 April 2015). In 2015, Scully oversaw a complete renovation at the Romanesque chapel Santa Cecilia de Montserrat, near Barcelona, featuring his work in dialogue with the historic architecture and restoring the church to working condition. Sean Scully’s work is in the permanent collections of numerous important institutions including the Hirshhorn Museum and Sculpture Garden, Washington, D.C.; The Metropolitan Museum of Art, New York; the Museum of Modern Art, New York; The National Gallery of Art, Washington, D.C.; Solomon R. Guggenheim Museum, New York; Walker Art Center, Minneapolis; Whitney Museum of American Art, New York; Art Gallery of Ontario, Canada; Tate Modern, London; Irish Museum of Modern Art, Dublin; De Pont Museum of Contemporary Art, Tilburg; Kunstsammlung Nordrhein-Westfalen, Düsseldorf; Museo Nacional Centro de Arte Reina Sofia, Madrid; Albertina, Vienna; and Guangdong Museum of Art, Guangzhou, China, among many others. In 2015, a permanent site-specific installation of his work was unveiled at the Romanesque chapel Santa Cecilia de Montserrat, near Barcelona.